THIS POST IS SPONSORED BY NUHEAT. There are two rooms in our house that HandyMan has had more of a decorating say in: the organized garage and the new laundry room. And who am I to argue if the man wants to spend more time doing laundry? To make the laundry room a more enjoyable place to spend time in, we've added in a few little luxuries. One of these is in-floor electric heating. We have floor heating in our main bathroom and always regretted not putting it in our kitchen as well (we only thought of it once all the electrical work had been done). But floor heating was a must-have for the basement because cement floors + ceramic tile + living in Canada = popsicle feet in the winter, people! The kind folks at Nuheat provided us electric floor heat mats for the laundry room and basement bathroom. Since our rooms are fairly rectangular, we went with the standard mat sizes though you can have the mats made to fit in a custom size. Its such an affordable luxury too - we've been told that our main bathroom floor heating cost only about $0.05/day to operate. Installation was fairly easy too. The electrician connected the lead wires to the junction box and then the Basement Spaces guys installed the mat: apply a layer of thinset, roll out the mat, then press down the mat using a rubber float. You'll notice we only put the mat down the middle of the room. There will be cabinetry along the left and right walls so no need to have heating there. 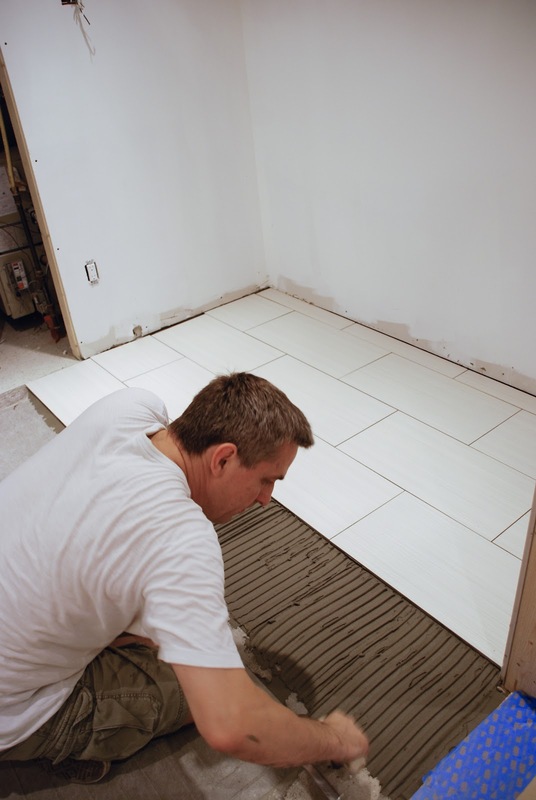 HandyMan doing his tile thing. 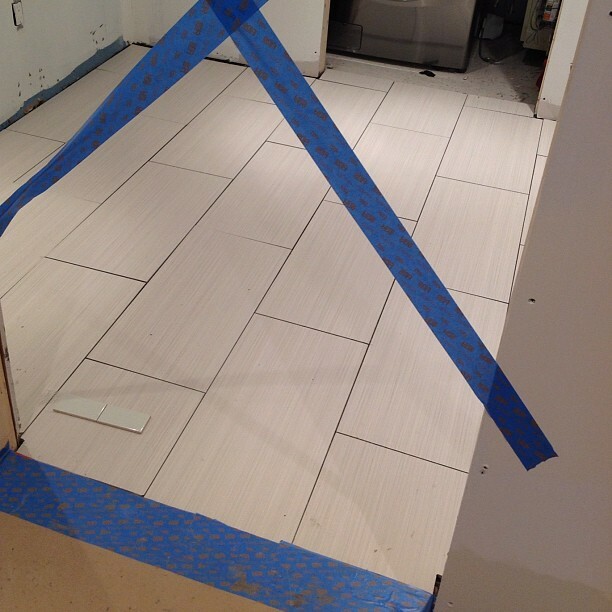 So now we have to grout this baby and do the tile in the bathroom too. The electrician will be back soon to hook up the floor heating to the thermostat and we can get on with making this laundry room a lot more luxe. Yay for progress!